My being there, like his being there, has a long and complex history. There are many possible answers, all of which are partly true and partly false, or at least incomplete. I would like to share some of them with you. There are many other sermons that might be preached from my experience visiting two death row prisoners during my sabbatical: sermons about models of rehabilitation, about violence, about forgiveness, about education, about friendship, about the role of the guards, about the role of the taxpayers, and the voters. In this morning’s Chronicle there is one front-page article on U. S. Supreme Court Associate Justice Kennedy’s assessment that the United States has too many people in jails—people who do not need to be there. There is another front-page article on Mexico’s refusal to allow accused persons to be extradited to the United States because our penalties here are harsher than those allowed by the Mexican constitution. We are in the midst of the most bizarre governor’s race in our state’s history. Grey Davis’ acceptance of money from the prison-guards union and his support for the prison industry at the taxpayer’s expense, not to mention the expense of justice for accused persons, is one of the biggest blights on his record. Yet, we hear little mention of this from our media. I could also talk about our own church’s partnership in “The Garden Project” a program of the Sheriff’s Office which enables prisoners in our county jail to grow organic vegetables for sale to restaurants and the general public. There is also the question of what gives us our sense of security. We live in a culture of violence that for many starts with the prenatal care given to low-income mothers and at the other end has atomic bombs and death row prisons. For me it is a sign of hope that this church remembers the anniversaries of Hiroshima and Nagasaki, and invites everyone to place their security, not in the death row prisons, but in establishing right relations between people. All of this is grist for the sermonic mill. This morning I will stick to the question of why I went to San Quentin and what I found there. Was it fun for me? When David asked me this question I had been snowboarding for the first time in my life the week before—another one of my sabbatical adventures. Now that had been fun. This was not fun, at least, not in the same category. And yet, sitting there, playing a game of Scrabble®, sipping Coke®. and eating chocolate chip cookies, there were parts to this that might be described as fun or at least enjoyable. I looked at David and thought about my answer. No, this is not fun. I’m here because Jesus sent me. In the Gospel of Matthew, chapter 25. Jesus said, for I was in prison and you visited me. And when his friends asked him, When did we visit you in prison? He replied, Whatever you did for the least of the people, you did for me. No, this is not fun. I’m here because the first principle of my faith is the inherent worth and dignity of every human being. I have always considered the death penalty to be in violation of that principle. Until I came to California I had never lived under a government that assumed that it had the right to take the lives of its citizens as part of its normal operations. Shortly after coming here I joined with others who are working to change that. Those of us who belong to organizations working to abolish the death penalty sometimes refer to ourselves as abolitionists—the same name used by those who worked to abolish slavery in the first half of the nineteenth century. It is an apt parallel, partly because our cause will ultimately prevail, and partly because, while we are united about the desired outcome, we have several different strategies about how to accomplish that outcome, and we don’t always get along with each other. This was exactly the case with those who labored to abolish slavery a hundred and fifty years ago. During my first years in the abolition movement I felt no need to establish any personal relationship with any of the men on death row. I wondered about the sanity of some of my fellow abolitionists who developed deep friendships with the murderers of their family members. I could much better understand a murder victim’s family member who said: I don’t want to ever meet the murderer of my daughter, I am not interested in talking about forgiveness with this man, but neither do I wish to live under a system that perpetuates violence—killing this man would only make things worse. Then, as I attended hearings and protested the deaths of different men on death row, I began to learn about them. In one case, that of Darrell Rich, who brutally molested and killed a number of women, it felt like here was a man who was a poster child for the death penalty; perhaps he did deserve to die for what he had done. My opposition to his execution was not because I mourned the loss of his particular life, but because I still believe the death penalty demeans us all, and while the state might have convicted the right man in this case, I do not trust the state to always get things right. In other cases, like those of Manny Babbitt and Jay Sirapongs, I felt like these were good men whom life had dealt some tough blows and who had made some bad mistakes, but given the opportunity, were capable of improving themselves. Away from the influence of alcohol and drugs they were able to make better choices. Putting these men to death made absolutely no sense. A year after Manny Babbitt’s execution I met his brother Bill and told him how honorably I thought his family, including Manny, had acted during their terrible ordeal. We were in Sacramento at a rally to end the death penalty. He, for his part, was grateful to receive from me a poster that some people in our church put together depicting Governor Grey Davis looking a bit like a Saturday matinee monster with the caption: “Stop Me Before I Kill Again.” Our goal had been to inject a bit of humor into a humorless situation. But for Bill Babbitt it was personal. In my heart I knew it was time for me to take this struggle to a more personal level. I am here visiting you (I thought to myself) because something changed for me after I shook Bill Babbitt’s hand. I contacted a friend at the California appellate project, who gave me the name of three men who she thought might benefit from visits. Two of them wrote back to me, and I began the process of applying for visiting privileges. Part of the prison culture is to assign people to roles, make up lots of rules about the roles, and then enforce the dickens out of those rules—depending on the whims of the enforcers. I was interested in possibly tutoring some of the men. However, tutors are not allowed to discuss personal issues with the prisoners. They are not allowed to write to the prisoners. They are not allowed to have any contact with the prisoner’s families. They are not allowed to remain in contact with the prisoners after their tutoring has been finished. It is also possible to serve as spiritual advisor to a prisoner, which gives one special visiting privileges leading up to the time of an execution. But there are also limitations that are sometimes imposed on spiritual counselors—and since what spiritual advisors are and are not allowed to do has landed up in court several times in the last decade, some of the guards tend to be wary of “spiritual advisors.” I decided to apply for visiting privileges simply as a “friend” of the prisoners. Jack had written to me that I should not be afraid of visiting him in prison. I was not afraid, I was terrified. Which is to say, I really was not afraid that he might hurt me, I was much more afraid of the guards; they are, after all, the ones with the guns. I was not afraid of violence being directed against me, I was afraid of being caught in the midst of other people being violent against each other. I was also afraid that I might have nothing to say to this man. I was afraid that I might not like him, that he might not like me. I had been advised that I would not be allowed to bring anything with me for the visit–nothing but a driver’s license or other photo I.D., and two keys. No one told me about the money. You are also allowed to bring up to $30 in one-dollar bills. I’ll get back to that later. In order to visit someone on death row you have to follow what are referred to as the “Condemned Visiting Rules”. I wondered if the person who drew up those rules had a sense of humor, or just poor grammar. I noticed that many of the signs contained grammatical errors, and then it occurred to me that probably the prison did not employ a lot of English majors on its staff. According to the condemned visiting rules, if you want to make an appointment you first have to be approved. You then have to phone the prison between 8 am and 10 am exactly one week ahead of time. Visiting days are Thursday through Sunday. If you want to visit on a Thursday, you need to phone between 8 and 10 on the prior Thursday. The phone is usually busy. Usually I would sit down with a magazine and the redial button. Or some mornings I would be driving the children to school. My son Aidan would press the redial button on the cell phone every 30 seconds. Then, when he actually got it to ring, I would pull the car over to the side of the road to make the appointment. Arriving at the prison I go first to the parking lot which is near the water. San Quentin has a magnificent view of the San Francisco Bay. I then walk up to a door with a glass window and buzz for admittance. One can be admitted up to 15 minutes early, but if you are late for your appointment, you are not allowed in. The guard may also decide that he or she does not like the way you are dressed and refuse to admit you. There is a dress code posted as part of the condemned visiting rules, but they seem a bit unclear, and all those who make regular visits agree that what it boils down to is whether or not the guard approves of the way you are dressed. Once you get past the initial guard you walk the length of two football fields, through another guard house, then another city block length, then past two automatically locking doors into a large room subdivided by wire cages into about thirty different visiting areas. Against one wall there is table with copies of the Bible and the Koran. Games of chess, Scrabble ®, dominoes. Against another wall are six different vending machines and two microwave ovens. You remember I said I was going to get back to the one-dollar bills. That’s what these are for. You can buy Coke ®, coffee, chicken wings, Dorito ® Chips, popcorn to pop in the microwave, Almond Joys ®, Sour Skittles ® and various other treats. On my first visit I got this far and had no money. An older man, visiting another prisoner, correctly surmised my situation and without a word put six one-dollar bills in my hand. I thought I was going to cry.. The name of the first prisoner I visited is Jack. He is gregarious. He plays basketball. When one of the news reports referred to his girlfriend, three different mothers were sure that it were talking about their daughters. Jack reads Anne Rice novels. He is sure that he is innocent, that if people knew his story they would be outraged. I am not sure this is true, but I am sure that he believes it. We sometimes play chess. He is not the one who asked me if visiting him in prison was fun. I think he assumes that it is fun for me. The one who asked me if this was fun for me was David. 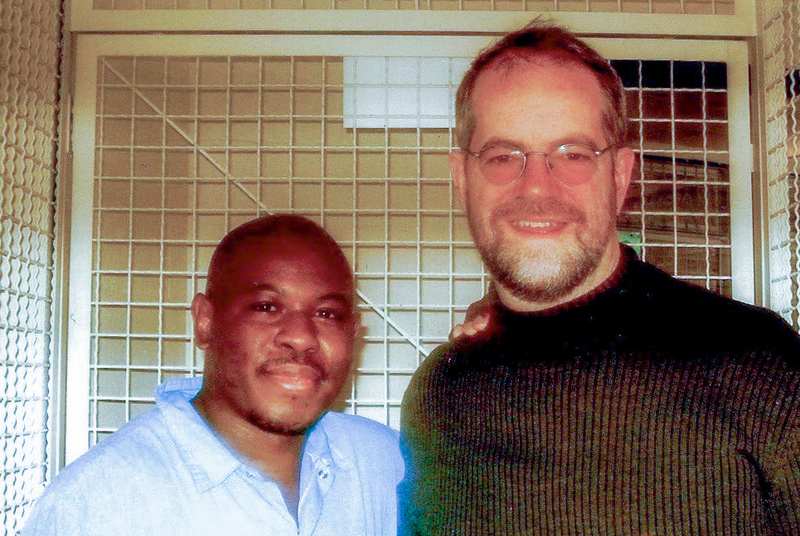 David was in the prison hospital in Vacaville last January when my sabbatical started. That was what I was told when I phoned San Quentin. When I phoned the prisoner locater phone line I was told that he was in transition back to San Quentin. David was in transition for six weeks. I had images in my mind of his walking, or perhaps doing somersaults, between Vacaville and San Quentin. David is quiet, thoughtful. He has a number of scars on his wrist and neck. He often attends the religious services at San Quentin and spends a lot of time reading the Bible. I was hesitant to play chess with David. I did not want to bring that competitive energy into our relationship. I asked him if he like Scrabble ® and he said that he had never played it. We played Scrabble® on two successive visits. He was good at it. He has done a lot of reading in prison and it shows. On another visit he taught me how to play dominoes, which I had never played before. The two men I visit are very different from each other. However, both of them come from families without money, who did little to try to help them succeed in school. Both of them are interested in the Bible and are especially attracted to passages where God reveals himself to be all powerful, casts down the oppressors and exalts the downtrodden righteous. I listen to them and have learned much from them. It is curious to me that these men see themselves as the virtuous downtrodden, while most of society judges them to be wicked. It occurs to me that part of my gift to them, perhaps the most important for me, if not for them, is to share with them my conviction that I don’t believe in a God who separates humanity into the saved and the unsaved. I believe wherever we are going, we are going there together; that is part of the reason I am there with them in the first place. So why should it make any difference to me what Jesus said about visiting those in prison? There are lots of sayings attributed to Jesus that I ignore and am quite happy to keep on ignoring. I once even heard a therapist suggest that Jesus was speaking metaphorically about prison visiting–talking about visiting the prisoner inside yourself. I don’t think so. I do believe that many of the statements attributed to Jesus should be understood metaphorically, but not this one. Come along this path of thought with me if you will. If, when Jesus said, I am the way, no one comes to God except through me. he was speaking metaphorically, equating himself with his teachings on love and forgiveness, and really saying, no one comes to God except through the paths of love and forgiveness? Then the commandment to visit those in prison makes perfect sense. If Jesus was only referring to belief in his personal self as being necessary for salvation, why would there be any reason to visit those in prison? Why wouldn’t you simply spend all of your energy concentrating on Jesus as some of his followers do? I was talking to a friend who lives in Tiburon, a well-heeled community one peninsula over from San Quentin, about how my sabbatical was going. I told him about my prison visits and thought to tease him by adding, so I do get over to your neighborhood occasionally. He did not laugh. I don’t think of that as being in my neighborhood, he said in a serious tone. I let it go. But driving out on my next visit, as I passed the Tiburon exit, without my bidding, a Sesame Street tune popped into my head, Oh who are the people in your neighborhood? They’re in your neighborhood, they’re in your neigh-bor-hood, they’re the people that you meet each day. But of course my friend in Tiburon does not meet my friends in San Quentin. And that is part of the problem. Why do I go to San Quentin? I told David that it was not really fun for me, but I was there because he was there. Because we are neighbors. Because we are already connected in ways that I am not happy about, and I would like us to be connected in some healthier ways. I usually end my prison visits with a prayer. And I would like to invite you to join in a similar prayer with me now. Spirit of love that holds us together. Be with us now as we seek your shelter and guidance. Help us to be kind to those we meet. Help us to keep our love of life alive. We pray not only for ourselves but also for those to whom we are closest, our family members and the people that we meet each day. We pray for love and for all human beings, and health for all living beings with whom we share this planet. May we learn to live together in peace. Help us to have peace in our own lives, and to bring peace to others. I’m Bob Bacon. Most of you know me as a member of the Board of Trustees here at the church, but in my day job I practice law. I represent four men on death row at San Quentin in the post-conviction review process. Representing a person on death row involves learning and telling the details of that person’s individual life story, for as Sister Helen Prejean teaches us, every person is far more than the worst thing that he or she has ever done. John asked me to speak a few minutes this morning about the people on death row, so you wouldn’t get the impression that all death row inmates are necessarily like the two men he will talk about, or the four I represent. What is a death row inmate like? There are as many different answers as there are death row inmates: something over 600 men at San Quentin, and 14 on California’s death row for women at Chowchilla in the San Joaquin Valley. There are people on death row in their mid-20s and four men who are over 70 years old. There are published authors, professional artists, and people who cannot read or write. Some went to college; some received their education in the special ed classes for the mentally retarded. Some have been in prison or jail every day of their adult lives; a few used to be police officers. Some of them won significant military medals for bravery in combat; others flunked out of basic training. There are schizophrenics, uncommunicative and lost in their own world that no outsider can penetrate. But others can discuss the detailed nuances of current world events. Some have a spotless record of conduct in prison; others have committed serious violent crimes since they arrived on death row. There are recent immigrants and 8th-generation Americans. Some grew up in abject poverty, some in upper middle-class surroundings. They grew up on farms and in small towns and suburbs and central cities. Some of them have many friends and family members who visit them and write to them and take care of them; others have absolutely no one on the outside who cares that they are there. They live in a world in which the leading cause of death is not execution but suicide; depression was extraordinarily common among these people even before they were charged with a capital crime or sent to death row. Humans tend to be very resilient. Even when something goes terribly, terribly wrong in a person’s life, people can usually cope and endure and recover, especially when they have a support network of family and friends to help them. The people on death row tend to have had three or four or five things all go terribly, terribly wrong in their lives, and they have lacked the support system to help them through. Many have been victims of horrific child abuse; the psychologists who have studied what it is like to grow up in one of these families say it’s a lot like the experience of being a prisoner of war. Many suffer from organic brain damage, which can occur for many different reasons, and often impairs the ability to reason from cause to effect, to think abstractly, and to anticipate the consequences of your behavior. Many came into this world with genetic weaknesses of mind or body or both. Or they suffered serious illness or injury. Or they witnessed the sudden and violent death of a parent or another loved one. Too often, when three or four or five things like that all go so terribly wrong in a single life, the person is caught in a downward spiral from which they can’t escape, and eventually they find themselves in a situation which ought to resolve itself simply and without violence, but instead tragically and unnecessarily results in the killing of another human being. So what is a death row inmate like? They represent a fair cross-section of human weaknesses and frailties, and also a good share of human strengths. Not a single one of the things I have mentioned this morning is unique to people on death row, or to people who have committed violent crime. In the last analysis, the people on death row are like the victims of homicide and like the rest of us, fellow wayfarers on the journey. I hear him leading his horse out of the stall; I hear the clatter on the barn floor. But I will not hold the bridle while he cinches the girth. I shall die, but that is all I shall do for Death; I am not on his payroll. I will not tell him the whereabouts of my friends nor of my enemies either. But a stranger unto you and an intruder upon your world. Than the lowest which is in you also. Even as the black thread and the white are woven together. And he shall examine the loom also.